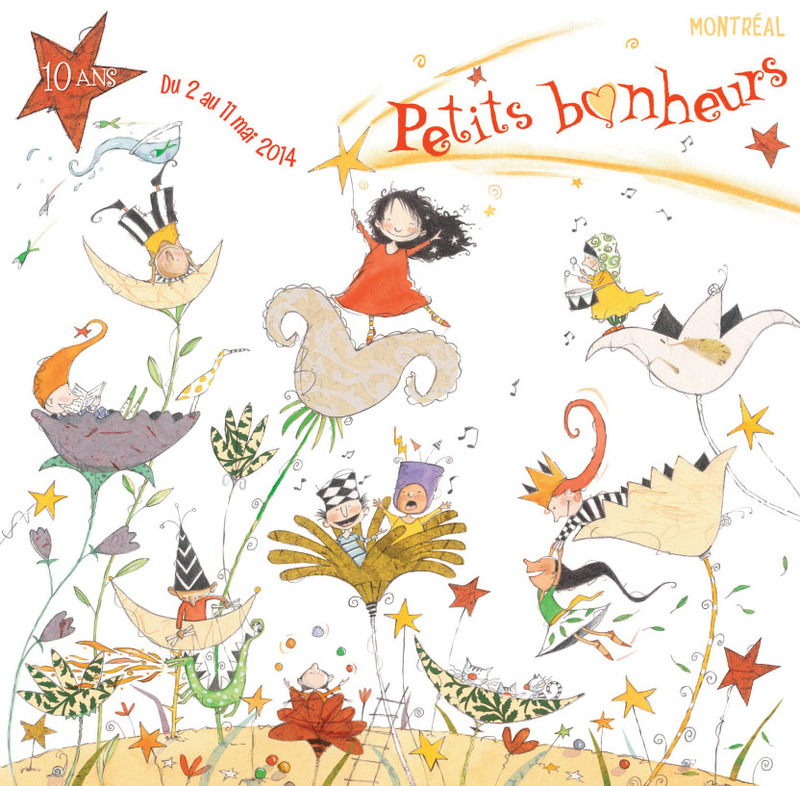 Every spring for the last ten years, a wonderful festival called Les petits bonheurs (Small Joys) has bloomed in Montreal, the city of never-ending festivals. I have illustrated the posters for this festival and it has been an interesting challenge to create an image year after year with the same general theme: a festival of arts and culture for the very youngest of our children while reinventing an image that by its style and content is instantly recognizable but different each time. It is impossible to illustrate all the events, of course: music, song, dance, performances, puppet plays, theater, readings, workshops, all geared to children as young as 18 months to twelve years old. So each year what I have tried to do is create an illustration that evokes joy, excitement, humor and a sense of discovery. I want the ambiance to captivate and delight children and draw them into exploring the image in its tiniest details, while letting their imaginations soar. I realized that to do this I had to go through the same creative process as when I write and illustrate my books – in other words, to tell a story, but one that evolves in one image instead of many. If you look closely at the posters from 2008 to 2014, you will notice that from one child swinging on a trapeze trailing in her wake stars, musical notes and a flying rabbit, I multiplied the number of children each year as if I was illustrating the “story” of the festival and its success, while adding new whimsical details as well as repeating the familiar icons that conveyed the events of past years. It was as if I was adding a chapter each year to the “story” of Les petits bonheurs. At one point, the festival team, that had fallen in love with the little girl in the red dress from the first poster, asked if I could bring her back. So she reappeared in the third poster and if you look closely you will find her popping up here and there. The tiny characters I created have traveled by boat on mermaid-inhabited seas, paraded a pink elephant around cardboard castles, opened exploding surprise boxes, formed human pyramids and flown through a five-mooned sky where cats travel in teacups alongside schools of fish. This year I was inspired by our long awaited spring and created the Garden of Small Joys where each child, clown, acrobat or cat performs inside a blooming flower. 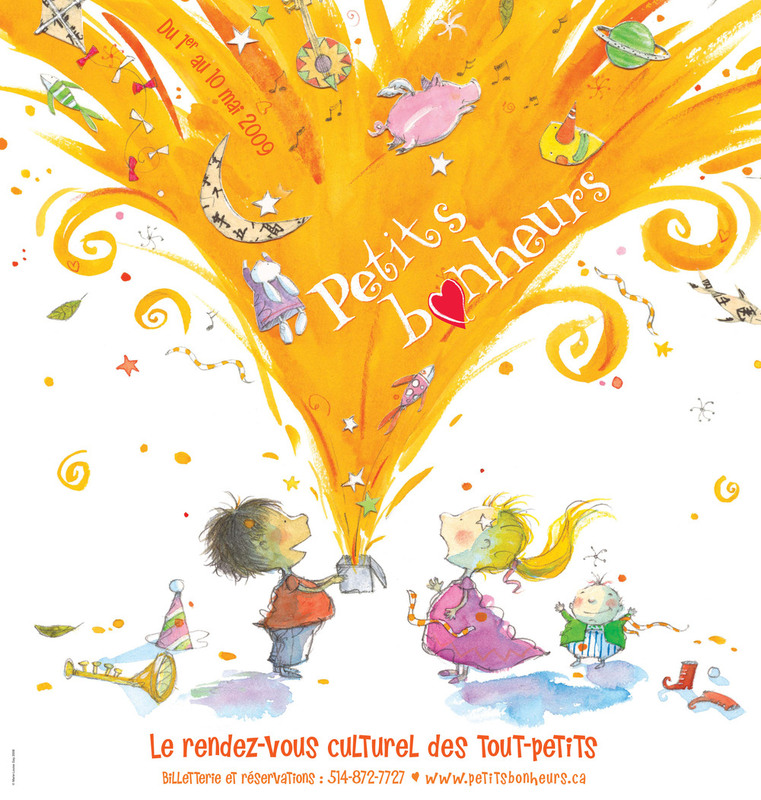 Depuis plusieurs années, j’illustre les affiches du Festival des petits bonheurs, un festival des arts et de la culture pour les tout-petits qui a lieu dans le quartier Hochelaga Maisonneuve à Montréal. C’est tout un défi de créer année après année une image qui annonce le même évènement tout en se renouvellant et en respectant le thème. Impossible, évidemment, d’illustrer tous les évènements qui se produisent durant ce festival: music, danse, performance, magie, théâtre de marionnettes, lectures et ateliers autant pour les enfants de 18 mois que ceux de 11-12 ans. J’ai donc choisi de créer une ambiance joyeuse, ludique, fantaisiste, parsemée de petits détails et clins d’oeil complices qui captiveront les enfants. J’ai essayé d’inventer un monde fantasque, habité par un nombre croissant de personnages: enfants, clowns, sirènes, acrobates, éléphants roses, chats, lapins et poissons volants. En fait, j’ai choisi de raconter une histoire utilisant le même processus créatif que lorsque j’écris et j’illustre mes livres jeunesse. C’est l’histoire des enfants qui fréquentent joyeusement année après année le festival Les petits bonheurs.